Take a look at HiRISE's birds-eye view of MSL Curiosity, taken on the 157th sol of it's mission in Gale Crater. 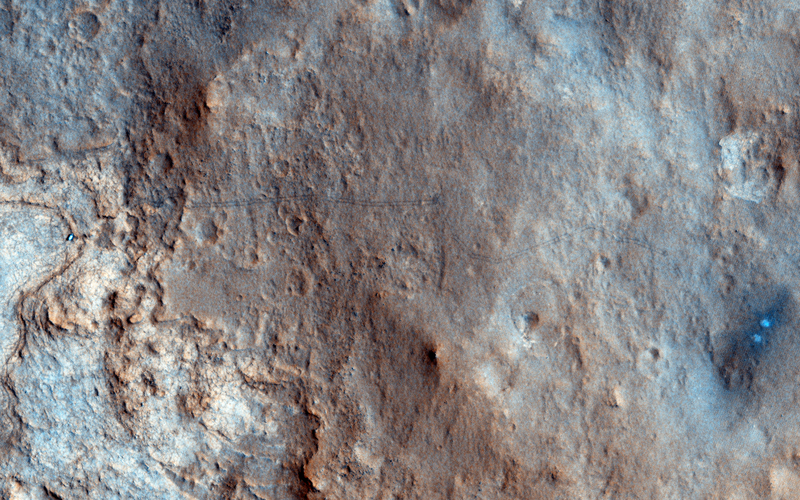 In this image you can see the rover itself, as well as tracks left from MSL's movement across the Martian terrain (this is especially true if you click on the image). The bright white/blue dots on the right shows the the area that was directly below MSL's Sky Crane rockets. Because of wind and other factors, the earliest tracks from MSL have begun to fade, but fortunately they can still be made out in the larger high resolution version (just click the image below to see it)! 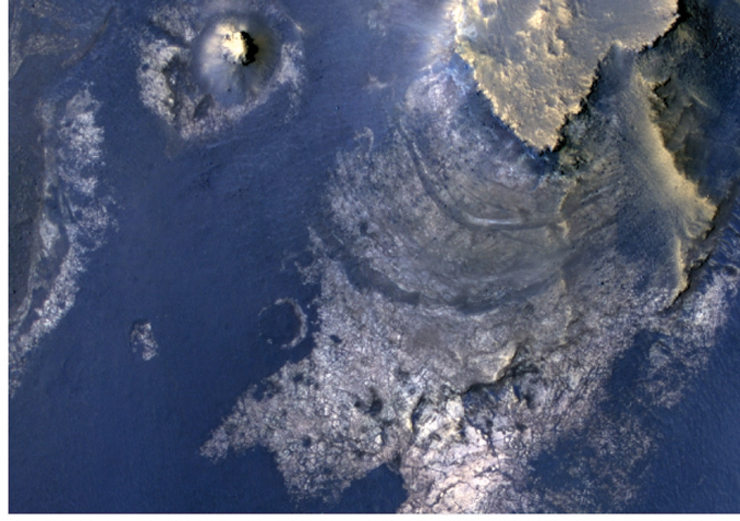 This image is quite significant because it is the first color image showing MSL's tracks from orbit. It is oftentimes these images that provide us perspective because they show us the impact we are having on this pristine planet. Every rover we send to Mars is breaking new ground, every image shows a never before seen world, every soil analysis enhances our understanding of the solar system and provides context for our place in the universe. The below image shows the first patch of rock on Mars that Mars Science Laboratory's (MSL) Dust Removal Tool (DRT) brushed off. This dust removal took place on the 150th Martian sol of MSL's mission (6 Jan 2013) on a rock named Ekwir_1. The cleared patch of rock is 47x62mm (1.85x2.44in). 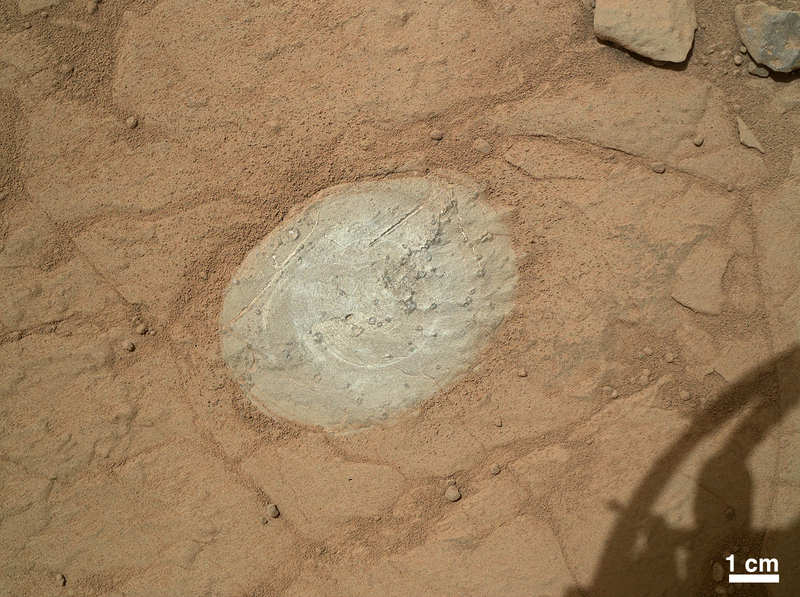 MSL's Dust Removal Tool is similar to Mars Exploration Rovers Opportunity and Spirit's Rock Abrasion Tool (RAT), except that MSL's tool is primarily used for dusting surfaces off, while the RAT is often used to grind/drill into the top layer off a rock, exposing the unweathered material beneath for further examination. If you want to know what the DRT looks like, just take a look at the following image from NASA! These tools to remove dust are essential to any Mars rover's mission because essentially the entire surface is covered by a fine layer of dust. There could be incredible minerals or even evidence of life below the dust, but we'd never discover it if we don't remove that surface layer. As MSL continues on toward Mount Sharp it will undoubtedly keep using its DRT to expose the beauty of Mars that lies only millimeters beneath the surface. When it does I'll be sure to post those images too!